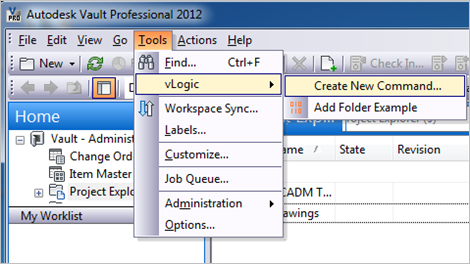 Update: vLogic 2013 has been released. As promised, I came up with something for those of you who want to customize Vault through the use of scripts. I decided to use PowerShell as the scripting engine since it has a lot of tools ready-to-use for this sort of thing. If you are not familiar with PowerShell, you can find tons of information on the internet, including the Microsoft web site. No Visual Studio required to write custom commands. 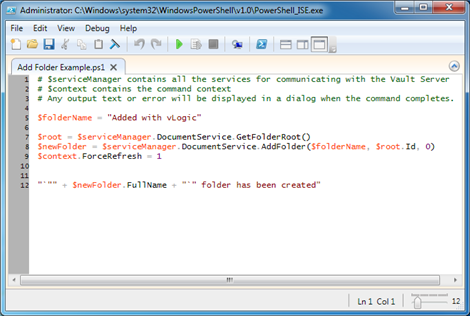 To create a new script, select Create New Command from the vLogic menu. After giving your script a name, you will have to re-start Vault Explorer. When the program re-starts, your command should show up in the vLogic menu. To delete a script, go to %ProgramData%\Autodesk\Vault 2012\Extensions\vLogic and remove the .ps1 file. You can also add commands by putting .ps1 files in this folder. There are some downsides to vLogic. If you are not familiar with PowerShell, then it’s basically a new language that you have to learn. If you have complex operations or UI, then you are better off using Visual Studio. As this moment, I have no good story for debugging a vLogic script. This is just my first pass at adding scripting to Vault. There is lots of room for improvement for future releases. Put on your Ramones T-shirt and get out your beige box because it’s hacker time. Not real hacking, of course, since I work for Autodesk. This is more of a “programmer for a major software corporation posting to a blog” style of hacking. Anyway, the goal is to display up a better message when our programs run across an error from Vault. For example, instead of “303” as the error message, I’ll show you how to display “PermissionDenied” or whatever else you want. There are over 800 error codes that the Vault server might return, and they always take the form of a number. We want to display something human readable and we don’t want to spend all day typing. 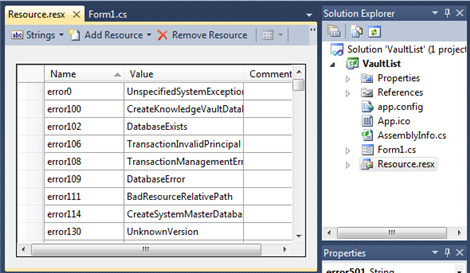 You can find the list of error codes in the SDK documentation. Go to the “Error Codes – Server” page has our list. It has all the codes, and it has text names of the codes. Right click on the page and click on “View Source.” This will pop up the raw HTML. Save the text as an HTML file. Now we have the codes out of the CHM. The codes are in table form, which is good, but we need to do more with this data. So let’s fire up a spreadsheet program. Open the HTML file in Excel, which will take the error code table and put it in spreadsheet format. Feel free to delete everything outside the error code table. We need to put a text prefix in front of our error numbers. Visual studio won’t like it if we have a number as our first character, so we are going to add the word “error” in front of all error number. Select all the error numbers, right click, and choose “Format Cells.” In the number tab, put in “error”0 as the custom format. Now we have a word in front of our error codes. 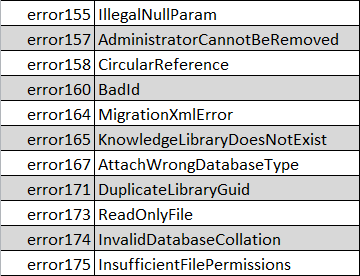 Your error code table should look like this. Inside of your Visual Studio project, create a new RESX file if you don’t have one already. To create a new one, you need to add a new Resources File to your project. If you are not familiar with the concept, a resources file is a place to store things in your program like images and string tables. It’s the perfect place for this error code table. 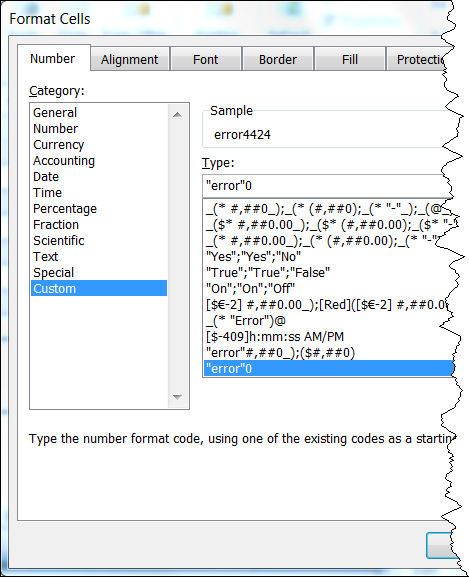 In Excel, select the first two columns from our error code table. Don’t select all rows, just the rows with error codes in them. Copy these cells. In Visual Studio, select your RESX file and go to the Strings part. Run the paste command and it should put in all our data. Now we have all our error codes in a format where it is easy to look up from our code. The code for the GetErrorAndRestrictionCodesString is from an earlier article. Here is the quick list of registration links for my upcoming webinar series. See my earlier post for full descriptions of each one. Update: The series is now completed, go here for the recordings. By default, Vault Explorer provides the View Properties Grid which provides a list of all property values for the selected object. This is a nice default view, but us developers commonly want to have customized property views (aka. property pages). 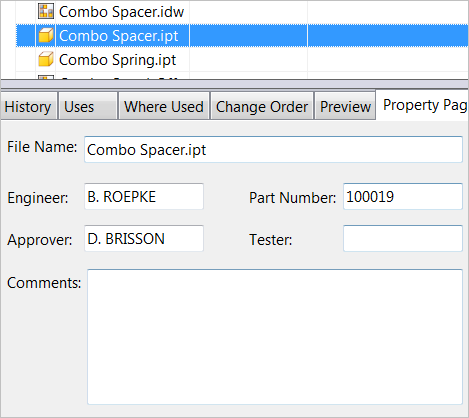 So here is a quick primer on creating property pages in Vault Explorer. Note: This article is basically a condensed version of Dan Leighton’s excellent AU 2011 class, Manage Dozens of Autodesk Vault Workgroup Properties with Custom Forms and Reports. If you have the time, feel free to skip the rest of this post and view the video on the AU site. Also, his handout is full of sample code! The first step is to set up your project for writing a Vault Explorer extension. You can read up on this in the SDK documentation. Or you can just copy the HelloWorld example and build off that. 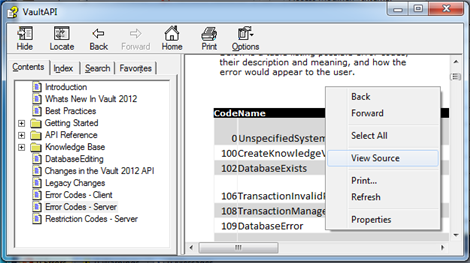 Property pages in Vault Explorer most commonly take the form of custom tabs or custom dialogs. 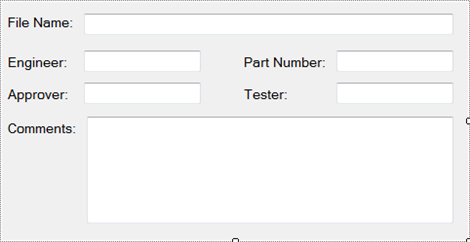 I’ll be showing an example of a custom tab, which means we start by defining our own User Control (right click on your project and select Add –> User Control). Now we have a blank control. Next you drag and drop controls from the Toolbox into your custom control. Usually each property will have two controls, one to display the property name and one to display the property value. A Label control is usually used for the property name. The value is usually represented by a TextBox, but there are tons of controls to choose from. Other useful controls are ComboBoxes, CheckBoxes, DateTimePickers, RadioButtons, and so on. For this example, I’ll keep it simple and just stick to TextBoxes. Now that we have our controls in place, we need a way to map the specific property values to the correct controls. Sure we could just hard code the mapping for each TextBox, but that doesn’t leave us with any reusable code. It also doesn’t make things easy for us in the future if we have to make changes to our property page. A better way is to add meta-data to our controls. At runtime we route the property data to the correct control based on the meta-data. There are a couple of ways to set the meta-data on a control. In this example, I’ll use the “Tag” property. 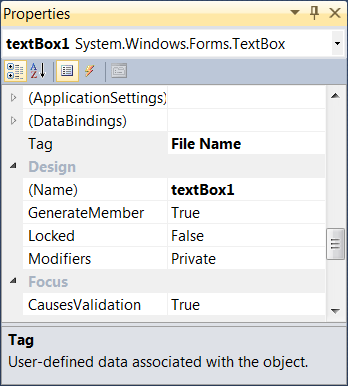 I want to set my TextBox Tag values to something that will let me locate the Vault property. You can use the display name of the Vault property if you are sure that it won’t change. Otherwise, I suggest using the system name. Or you could just copy my code from the examples below. If we ever need to display more properties on the page, it’s as easy as dropping in the new TextBox and setting the Tag value. This is just a simple example to get you started. More complex cases involve different data types, different control types and allowing the user to edit values through your property page. If you are getting started with the Vault API, there is a lot of information out there. Unfortunately, it’s all over the place. Some of it is on this blog, some of it is on AU Virtual, some of it is on ADN. Here is my attempt to fix all that. I’ll be doing a 5 part webinar series, covering all the major aspects of the Vault 2012 API. In total, there will be about 4.5 hours of content for the low price of free. If you do the math, that’s an infinite amount of content per dollar! This series is perfect for those of you new to Vault programming or those of you that want a refresher course. This webinar is an overview of the Vault API. The main purpose is to explain what you can do through custom programming using the Vault API. We will also go over some of the logistical aspects, such as licensing. Recommended audience: People new to Vault programing and people curious about Vault customization capabilities. This is the only webinar in the series that does not require programming knowledge. Note: This webinar will have the same content as the "Getting Started with Autodesk Vault Programming" videos on AU Virtual, but without the code examples. This webinar will explain how to communicate with the Vault Server through the API. We will be going over the basic concepts and common workflows, such as sign-in, sign-out, file upload and file download. Recommended audience: People new to Vault programing or people who want a refresher course. We will be going over sample code, so programming knowledge is required. This webinar explains how to extend the Vault Explorer client. We will demonstrate how to write custom commands and tab views. We will also go over tips and tricks for getting the most out of your customization. This webinar explains how to extend the Job Server feature. Basically Vault manages a central queue for distributing tasks to other computers on the network. We will see how the Vault API can be used to create custom jobs and custom handlers for those jobs. This webinar explains how to extend the Vault business logic through the API event mechanisms. There are several different types of events in the Vault API. We will go through each of the event types, learning the pros and cons of each time. We will go over best practices and tips for getting the most out of the event APIs. Recommended audience: People with Vault programing experience or people who have viewed the previous webinars in the series. Events is a complex programming topic, so this session is geared more for professional programmers. Note: This is the exact same content as the "Autodesk Vault Programming: Now with Events" class at AU 2011. I'll even be recycling the same jokes. Jim Quanci, the director of the Autodesk Developer Network, has started a new blog. Dances with Elephants focuses on how small companies can leverage big companies to build their business. I think Autodesk is one of the elephants, but I’ve never been good with allegories. Anyway, put your dance shoes on and head on over. Although most Autodesk blogs are focused on Autodesk products, there are a few blogs that barely mention our products. Basically, these blogs are just employees that feel they have useful information to share, and I think it’s very cool that Autodesk provides an outlet. I think I speak for all Autodesk bloggers when I say that we blog because we like to. There’s no corporate mandate on this content. We are free to post whatever we want, whenever we want, and I think the results speak for themselves. So keep on reading and we’ll keep on posting. The below code will save you a round-trip for each of your Vault API web service calls. If you have your own Vault client, you should put the code sometime during startup. If you are running inside an Vault client from Autodesk, this value should already be set to false. I don’t have much more to say on this. You find out more about the Expect100Continue property on MSDN.